Bunnak Norm (also known as Anak) took over Baray’s first village enterprise – called Songkhem – in Cambodia as Managing Director in 2001. She has been mentored and trained by Esther Ding, who believed in developing and building business ventures - for profit - among the villagers in order to improve the livelihood and well-being of the community. Anak was taught to generate income and move away from being dependent and when donor grants stopped coming she knew that training women, to generate income and have sustainable livelihoods by producing good quality handicrafts for the global market, was the future. The focus of Villageworks is on handicrafts production, which employs disabled workers and women in rural areas, which are sold in the Villageworks shop in Phnom Penh and through global export. 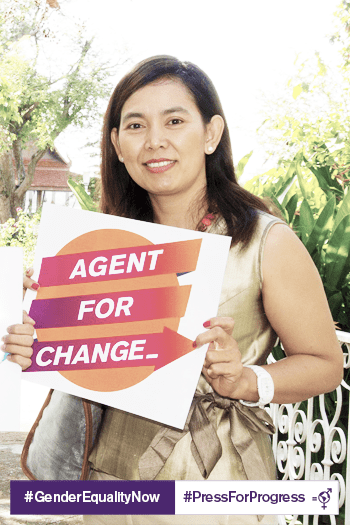 In 2011 Anak decided it was time to join WFTO, and with a vision to improve the lives of villagers and helping them to break free from the poverty cycle, Villageworks has now become Cambodia’s first WFTO Guaranteed Member. With the new product label Villageworks is now regularly exhibiting at European Trade Fairs and reaching a global market with their products. But Anak now has another vision and although in its infancy it will transform the lives of many families by creating sustainable employment, which will tackle issues such as education, healthcare and human trafficking. By transforming land they will focus on five key features; a lotus farm, a sericulture farm, handloom weaving, a tie-dye workshop and visitor centre. During the time of the Khmer Rouge regime all production of silk and cotton was destroyed and this now has to be imported from neighbouring Vietnam and Thailand. Producing raw silk and cotton on their own farm will greatly enhance the quality control of their supply chain and production. Ensuring that traditional skills are carried on and not lost is key to the success of this venture. Fifty women are to be trained in entrepreneurship and sericulture enabling them to feed into the supply chain of Villageworks by supplying them with yarn. Through membership of WFTO Anak has made contact with another WFTO GS member Eve, from Fair Trade Scotland and a new range of WFTO Fair Trade Tartan products has been launched which ensure the ‘added value’ in the supply chain benefits the Artisans that make the products. Villageworks and Fair Trade Scotland are working collaboratively on building capacity and impact assessment to ensure that the skilled weavers are paid more for the complicated tartan pattern and this should see an increase in the family income which in turn should lead to an improvement in health and education opportunities for the children. Anak is a testimony to the fact that women’s and girls’ empowerment is essential to expand economic growth and promote social development through Social Businesses that engage in the triple bottom line of people, planet and profit. 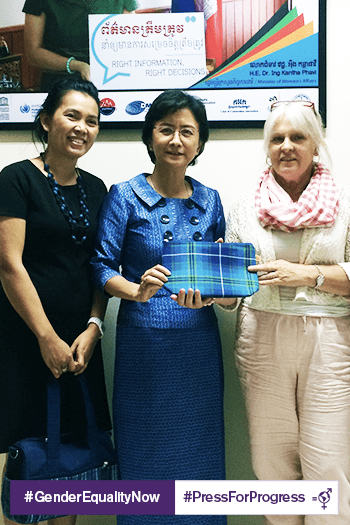 The photograph shows Anak with the Minister for Women’s Affairs who was delighted with a gift she chose from the WFTO Tartan range. She is a strong supporter of Gender Equality and supports Fair Trade as a way to increase livelihoods for women in the handicraft sector.